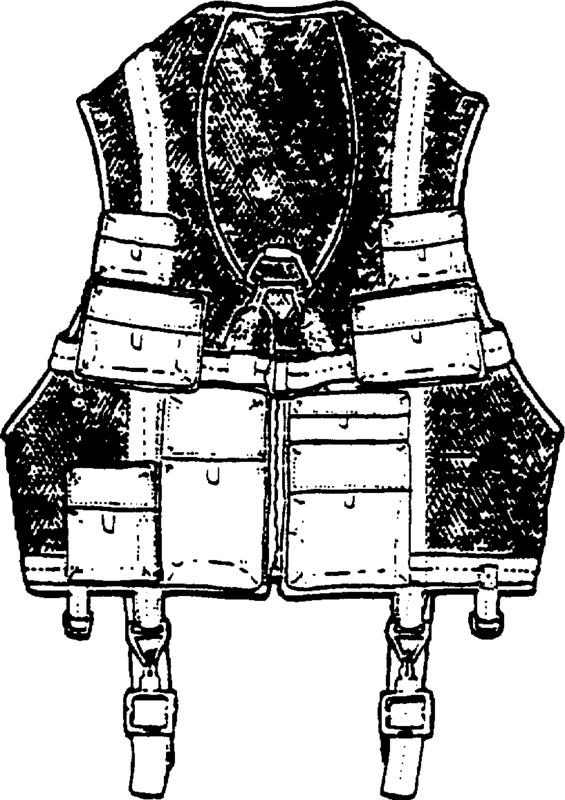 The vest contains a total of twelve pockets; eight front outer, two rear outer and two front inner, for storage of survival, signal and communication components. All pockets have fastener tape closures. For rescue-lift, a nylon webbing harness system is permanently attached to the vest in a cradle fashion and contains both leg and chest straps. The chest strap also provides the means for attaching the LPU-10/P life preservers. The vest also provides means for attaching a motor housing and face mask carrier when wearing MOPP clothing. A pocket is also provided on the vest for carrying a AN/PRC-90 or AN/PRC-112 radio. The knitted, aramid cloth used for the body of the vest shall be Olive Green 106 and shall conform to MIL-C-43989. The oxford aramid cloth used for all pockets shall be Olive Green 106 and shall conform to MIL-C-43842.